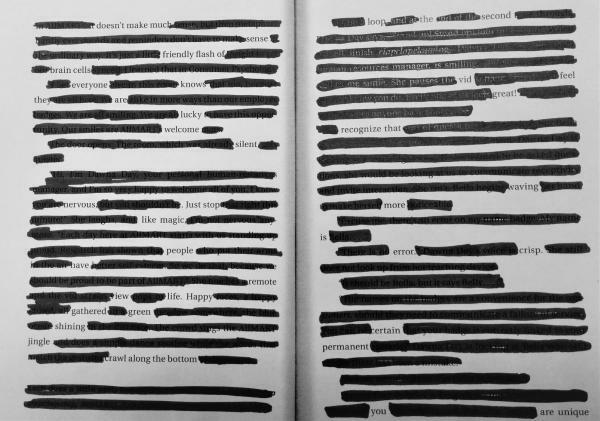 Create a blackout poem and enter it into our contest! Create a "blackout" poem by crossing out words on a book page and leaving behind only the ones that make up your poem. Book pages are available at the Information Desk, or you may use one of your own (make a photocopy of the page - don't tear it out!). Poems must be submitted to the Information Desk (or by using our online submission form at www.huntleylibrary.org/BOpoems) by April 30, 2019. One winner will be selected to receive an Amazon gift card, and will be contacted the first week of May. For grades 6-12.